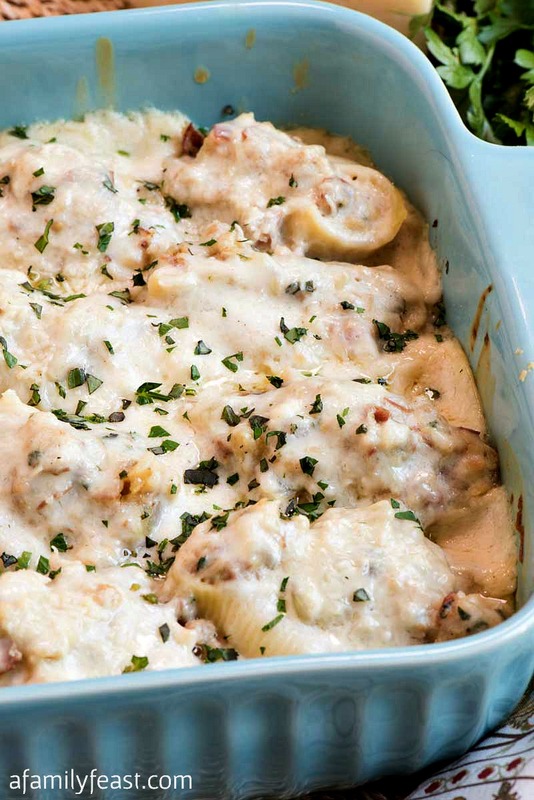 Bake up a batch of these Creamy Chicken and Prosciutto Stuffed Shells – then enjoy leftovers all week! I’ve said this before and I’ll say it again: We always know when we have a winning recipe on our hands when a friend immediately asks if the recipe is on A Family Feast, shortly after taking their first bite. 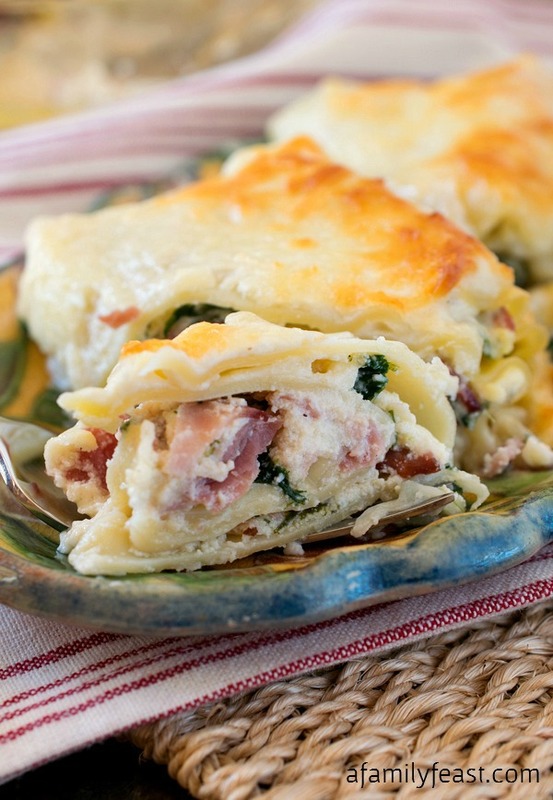 Such is the case with these Creamy Chicken and Prosciutto Stuffed Shells. We brought the tray over to a neighbor’s house a few weeks ago, and everyone devoured these super flavorful stuffed shells. These Creamy Chicken and Prosciutto Stuffed Shells are my idea of the perfect pasta dish, and one of the very best stuffed shells recipes you’ll ever make! 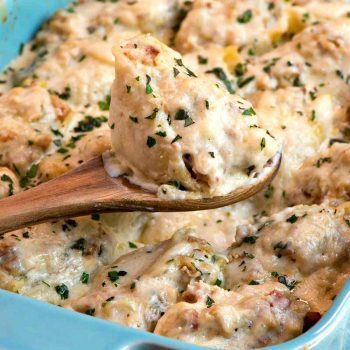 A mixture of ground chicken thighs, diced prosciutto, Romano cheese, a little bit of bread crumbs – plus fresh sage, basil, and parsley and other seasonings are combined then stuffed into cooked jumbo pasta shells. 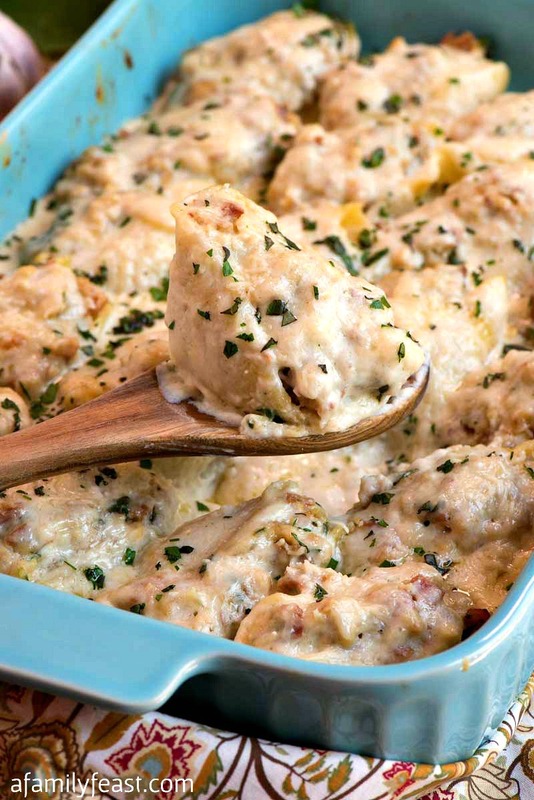 Then a wonderful, creamy sauce is spooned into a baking dish and the chicken and prosciutto stuffed shells are nestled in the dish. Before baking, we ladled even more of the creamy white sauce on top – then the dish is baked until hot and bubbly. 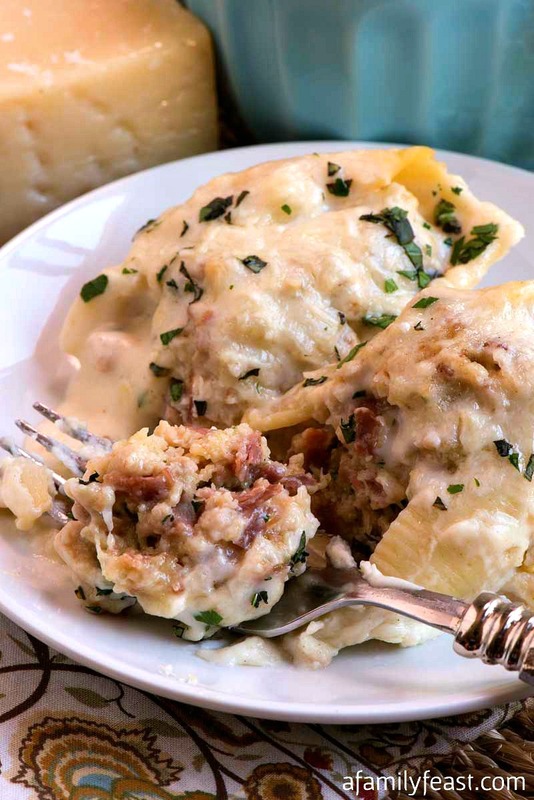 If you are fan of prosciutto – then you already know how wonderful it is added to any dish – and these Creamy Chicken and Prosciutto Stuffed Shells are no exception. 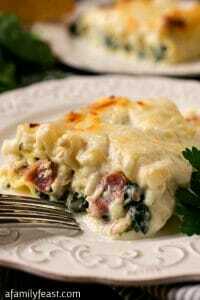 The zesty, salty meat really lends a wonderful punch of flavor to the creamy pasta and chicken. 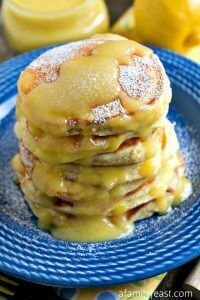 And if you’ve tried any of my husband Jack’s sauce recipes before – then you know that this cream sauce is so good, you’ll be tempted to eat it with a spoon. 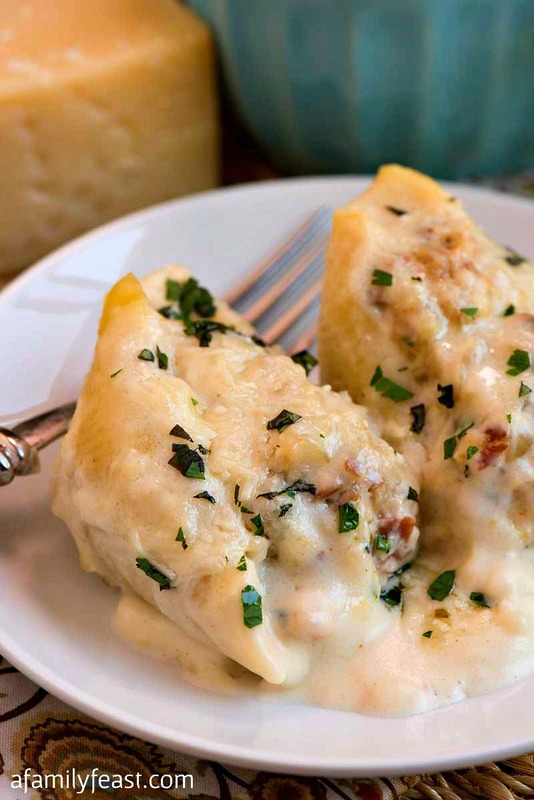 One batch of these Creamy Chicken and Prosciutto Stuffed Shells will feed a crowd. Or – if your family is smaller – they also reheat quite nicely so you can enjoy leftovers the next day. *For best results, buy boneless skinless chicken thighs then grind yourself or have your butcher grind for you. Place a large pot of water on to boil and once boiling, add two teaspoons kosher salt then the shells. Cook for 9 minutes then remove and rinse with cold water and set aside. In a large sauté pan, melt butter in oil and add onions and prosciutto and cook for three minutes over medium high. Add ground chicken meat, sage and garlic and cook just until the chicken is just undercooked. A few undercooked pink pieces is fine since it will continue to cook in the oven. Cool this mixture a little to about room temperature. In a large bowl, mix eggs, both bread crumbs, cheese, parsley, pepper and basil. Add the cooked mixture to the bowl and stir to combine. Heat a medium sauce pan over medium heat and add butter to melt. Once melted, add flour, stir and cook for three minutes. Add milk and whisk to form a thick sauce. Whisk in the half and half to finish the sauce along with the salt, pepper, mustard and nutmeg. Cook over medium for a few minutes then remove from heat. In a 9×13-inch pan, ladle a little of the sauce on the bottom and place the 20 stuffed shells onto the sauce, stuffing side up. Lade the remaining sauce over the top of each shell and cover with parchment and foil. Bake for 25 minutes covered and 5 minutes uncovered. 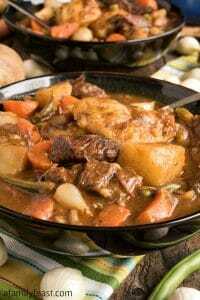 Oh this looks so tummy warming and comforting. Perfect for upcoming fall evenings. Is the sauce very rich? How could I lighten it up a bit? Would it still be as good with a light tomato sauce? Hi Laurie – It’s an alfredo sauce, so yes it is fairly rich. 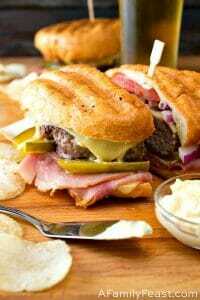 You could certainly try this recipe using a tomato sauce if you prefer – we haven’t tried that ourselves.